Russian Prime Minister Vladimir Putin is accusing opposition activists of intentionally provoking the government authorities into beating protesters by holding rallies in defense of free assembly, the Kommersant newspaper reports. In June, Russia’s presidentially-appointed human rights ombudsman, Vladimir Lukin, came out with a statement that the idea that rallies require sanction from the government to be held legally is actually completely false. All that the law requires, he said, was for event organizers to give the city a declaration of their intended actions. While Strategy 31 organizers routinely apply with the Moscow city authorities for permission to hold their rallies, it has never once been granted. Ralliers who gather despite the lack of sanction are routinely beaten by riot police and internal military forces, a trend that has drawn criticism from governments and rights organizations across the globe. 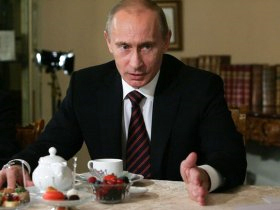 The prime minister insisted that he was unaware of Strategy 31 until his scandalous meeting with Kremlin-critical rock musician Yury Shevchuk in May, and that the decisions to disperse the rallies and to close Triumfalnaya Square (where the rallies are always held) for construction were taken without his knowledge. “I give you my honest word as a party member,” he declared in an expression harking back to Soviet times. The decision to close Triumfalnaya Square in order to build an underground parking garage was announced in mid-August. The abrupt decision took oppositionists and Russian civil society on the whole by surprise, and many have denounced the project as an excuse to put an end to the Strategy 31 protests. According to city officials, the square will be not be reopened earlier than 2012. Despite this, Strategy 31 organizers intend to continue their rallies, with the next event scheduled for tomorrow – August 31, 2010.